It's been far too long neglecting this little blog-o-mine. The last year has seen a lot of struggle, trying to regain control of the reins of my gaming wagon. For the most part, I'm back to playing World of Warcraft and a little bit of mobile gaming on the side. Particularly, I'm hooked on SimCity: BuildIt, but am seriously committed to play the game slowly, and free. The free part is of great importance, as last year I fell into the trap that many mobile gamers are facing. Free-to-play quickly can turn into pay-to-compete. I was completely addicted to Dungeons and Dragons: Arena of War (which was cancelled) and Hellfire: The Summoning, both by DeNA. The addiction wasn't the typical, "I play this game way too much." It was in the way that the "freemium" aspect of the games plays out. Sure, I played without paying anything for quite a while, but then the weekly competition concepts started to take hold. For Arena of War, competing was a matter of getting the elite abilities onto your character during the competition. In order to be competitive, you had to clear stages as fast as possible, to equip elite abilities in every slot of your character sheet or you would be killed in a single shot as you progressed. The option to earn the abilities from treasure chests on successful completion was there, but at rates that ensured that playing without paying would mean not acquiring the abilities in time to use them to compete. So at that point, players turned to the store, and take the gamble at possibly getting a useful elite ability. There is usually a sub-par elite ability that was guaranteed, but to really compete, the Legendary elite cards were the only way to really hit hard enough, and fast enough, to compete. The first time I hit the store, I got a "lucky" Legendary ability, and then tried a few more times. It was that first purchase that propelled me into the high ranks for the first time. For a person with a very competitive personality, and a propensity for gambling, this was a huge rush. Eventually, once I spent enough on ability cards and minions, I was powerful enough to compete each event with the big players. The spending didn't stop there, however. Each competition, you had to keep playing to keep competing. There were party buffs you could consume. Some were free, but once you were out, back to the store for more. Sure, there was free quest energy. This would last for 3 matches, then regenerate 1 point every 3 minutes. That translated into 1 match every 100 minutes. So, back to the store for Quest Energy Potions. You probably get the picture by this point. For every activity in the game, there were multiple items from the store that would keep you in the action. The competition ensured that players would always be hungry for more. I had done quite a bit, and learned how to play Arena of War with minimal spending. I had even posted to my Facebook page a how-to guide for players who wanted to compete for some decent rewards without paying. I had mastered the game, was in the top competitor group, and had made a number of friends. I was playing Hellfire: The Summoning on the side, which I found to fill the time I wasn't competing in Arena of War. Life seemed good, though I was blissfully unaware of the slippery slop I was sliding down. Then an announcement came: DeNA was closing the doors on Arena of War. The game had seen just under 1 year, and was very popular. Some conjectured that it was due to a licensing issue. Others thought that DeNA wasn't raking in large enough dump trucks filled with player's money. My suspicion is that it was a little of both, but it was clear that DeNA had made a policy that all of their games were required to have weekly competitions. Arena of War just couldn't keep up with releasing competitions on that schedule. Whatever the cause may have been, the game died almost instantly. Hellfire seemed innocuous, enough. Lob, kill, win. It also had a competitive side, with rewards for ranking higher. So I started to play it more and more, until I was probably hitting 40-60 hours a week of playtime. I wasn't ranking high enough to get rewards. Naturally, I thought, I would hit the store to compete better. At some point, I lost track of when, the gambling became more important than the game. I wanted the prestige of showing off the pretty cards I had "won". They looked cool, and were better than the rewards coming from the events, so I must have been winning, right? I had basically found myself in a casino via the gift shop. I wasn't sure how I wandered over to the slot machines, since the vending machines were just around the corner. Intellectually, I was aware of the situation I was putting myself in. I talked about it with a close friend, who was also playing Hellfire. I said I would, "Avoid the next sale..." a number of times, only to fall right into it head-first. Sometimes I'd get the set of cards I was after, most times I would either run out of money, or fall so utterly short of completing a set that I would give up. Usually, I would run out of money. My gambling predilection would outweigh reason every time, and I would return to the very same casino time and again. I had pushed my other games aside. World of Warcraft, and my passion for transmogrification was tossed aside. Link was left languishing somewhere in Hyrule. Mario never made it to the other castle to save the princess. It took the announcement and impending excitement with the release of World of Warcraft: Warlords of Draenor (WoD) to reignite my passion for gaming. Real gaming. Save the princesses, and princes, and worlds, and so forth! It was around the time that WoD was nearing the end of beta that I had finally broke the endless cycle of Hellfire sales by deleting all of my payment options from my Google Play account, effectively cutting myself off from the ability to continue gambling my spare, and sometimes not-very-spare money away. Within a few weeks of having cut the noose I put around my own neck, the appeal of Hellfire began to wane, and the veil I put over my own eyes was slowly lifting. I felt as if I had been in a trance, having told myself that a game was more fun than it was. That the money I was spending was making that game more fun. In fact, it was making it less enjoyable by the moment, and the fallacy that spending more would make it all better began to fade away. I still log into Hellfire, just to lob an orb, or two. I still say hi to the players who I've met along the way. But honestly, I'm done with it. I have seen the sales, and their empty promises of "8x Base Rate!" and "5x Activation!!!" and realize that it just means 8 times next-to-nothing and 5 times activation if you collect all 4 cards. A lot of gambling, minimal rewards, all in the hollow name of keeping the game "fair" for free players. These games have all one thing in common: They who spend the most, win the most. Clash of Clans, Hellfire, -Inserted Game of the Week Name Here-, and yes, even SimCity: BuildIt. All these games will reward heavy spending with fancy items, competitive advantage, endless hours of play time. What they will not give you is your money back. I really have the support of my sister, and my friend Serdal, to thank for helping me see through the lies I was telling myself. It took a long time for it to sink in, but they got through to me when I was too ashamed to seek help. The release of WoD was the final nail in the coffin for freemium games. Warcraft consumed my gaming attention, and allowed me to look at mobile gaming from a distance for the first time in a while. It was a hardening experience, one that I don't care to repeat, ever. For now, like most addicts, I'm taking it one day at a time. I am playing SimCity and have a wonderful little town, which cost me nothing more than my time. I have actually opened my 3DS and found that Link was still happily waiting to save the sages and help both Hyrule and Lorule escape the impending darkness. And I've rediscovered my love for the Draenor-that-wasn't-meant-to-be, and all the dress-up and player slaying that I have loved and continue to love. I've even found a little time to save a small country in the Himalayas from a tyrannical king using all the modern weapons at my disposal. Gaming life is good, and I'd like to keep it that way. Occasionally, being a parent is stressful. A lot of the time, my son won't finish his milk, water, or juice. However, I have to draw the line here. Just to be absolutely clear: My son doesn't drink Sriracha. He occasionally sneaks a taste of my dinner, and usually regrets it, though. He is a rambunctious little rapscallion, so in due time he will probably be a Dark Lord of the Sauce. Just like his daddy. I generally like to write. Be it comments on a blog, writing about someone's transmogrification set, or just random ramblings in this blog. Getting pen to paper, or in this case keys to screen, is important to my daily routine recently. I used to write stories about my role playing characters. Those stories lay across dozens of notebooks through the years. I hadn't really thought about them until I started writing a little something every day over on Mog's Addiction. That blog and all the site pages have spurned me to actually talk outside of the Warcraft chat box. 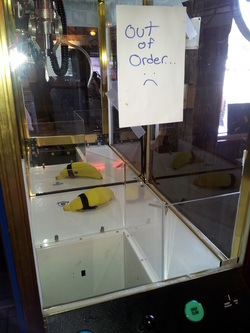 There is still the chance that they will repair the machine and possibly even fill the whole machine with bandanna bananas. Really, it could happen. I thought it might behoove me to start a little blog outside the World of Warcraft transmogrification and adventures, which is the focus of Mog's Addiction. There is a whole world out there, when I manage to get to it. The way I figure, all parts are equally important when defining the whole. Whether it's family, a movie, a book, a game, or just taking a look around you: All things make a person define the "who" of themselves. 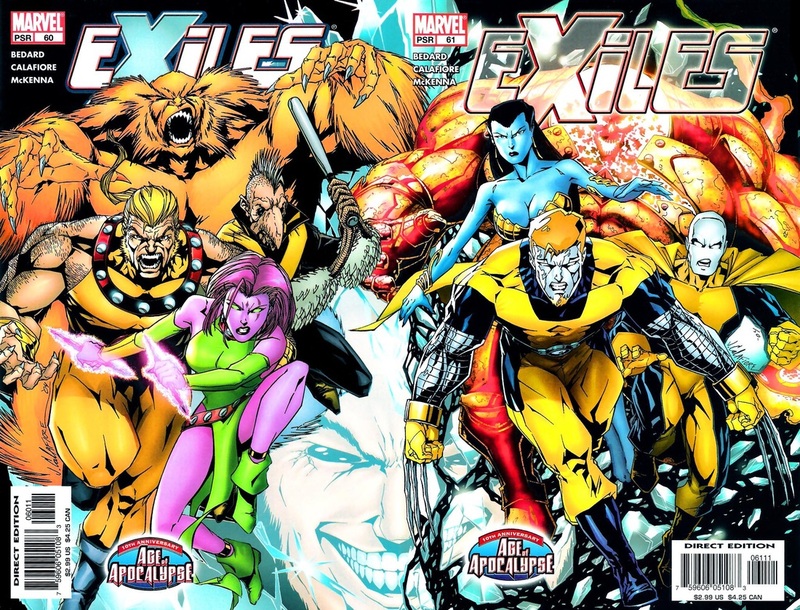 I am currently reading Exiles published by Marvel Comics. I'm still in book one of the Ultimate Collection. Having not read a lot of the various multiverses for X-Men, this appears to be a great primer for getting into the various characters and situations in the mutant filled (or not) Earths. My friend Sincerely found the name dropping to be a bit much, but for a greenie like me, it's great. Umlaut Paradots has been a long time gamer, Japanophile, and fan all things fictional. Author of the World of Warcraft Transmogrification website Mog's Addiction, Umlaut has been lost in Azeroth for quite some time. There may yet be salvation in a good book, graphic novel, or FPS to balance out the addiction into other foci.